Code freeze is March 1, 2014. Release is June 1, 2014. The list is aspirational; not all of it will get done. This talk is based on that list. 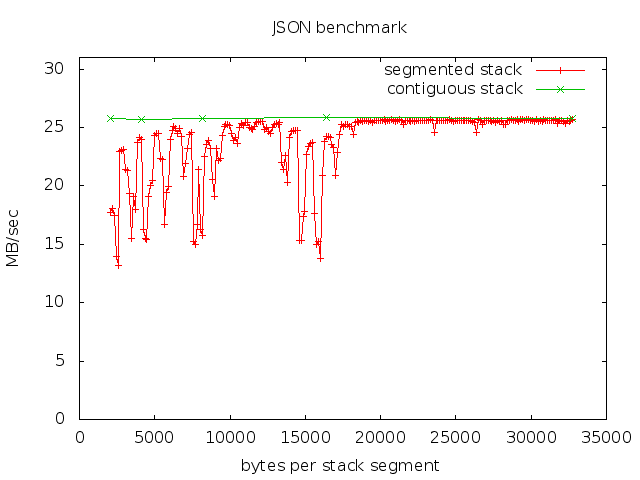 Go 1.2's stack split mechanism has a "hot split" problem. Copying (or "contiguous") stacks are grown by reallocation and copying. Resolves the "hot split" problem. Makes smaller initial stacks practical - more goroutines in the same space. The sync.Pool type provides a general thread-safe global free list. (for example, during garbage collection). This is an experimental type and might not be released. Native Client (NaCl) is a restricted execution environment for x86 binaries. Notably used to run compiled binaries inside Google Chrome. Go 1.3 targets that command-line tool for 32-bit and 64-bit x86 architectures. The Go Playground uses the NaCl tool chain to safely execute untrusted programs. The NaCl tool chain includes the fake time, network, and file system capabilities of the playground. Solaris: work in progress, on track for Go 1.3. DragonflyBSD: work is done, looking for a maintainer. Plan 9: still not finished. darwin/arm, android/arm: a contributor is working on these, some way to go. In Go 1.2, go build stats every dependent source file to see whether they have changed. This is a big chunk of total build time. The proposed "go background" command starts a daemon that watches source files for changes. When building, the go commands can ask the daemon which files have changed. A new os/fsnotify package will be added to the standard library to support the go command. The Go 1.2 tool chain can link against C++ code using cgo (but you need to write a small C bridge into the C++ code). The same can be done for Objective C code, with some modifications to the go tool. This will make it easier to write native OS X applications. As an experiment, I built "hello, world" at the release points for go 1.0. 1.1, and 1.2. Go binaries contain several sets of debugging symbols (for gdb, profilers, reflection, etc). We intend to rationalize these as part of some work on the linker. The gc tool chain is a bit unconventional. The compilers don't emit machine code but an intermediate assembly language. The linker translates it into machine code. 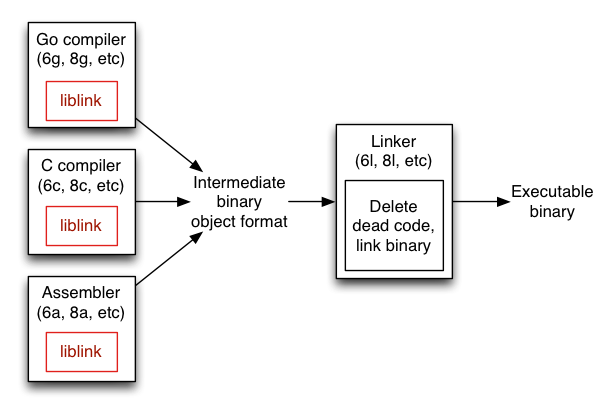 but the linking must be done by a single linker process after compilation is complete. because it does more work than a typical linker. delete dead code, merge what's left, resolve relocations, and generate a few whole-program data structures. In Go 1.3, much of the old linker is moved to a liblink library that is then used by assemblers and compilers (6a, 6c, 6g, etc). This allows more work to be done in parallel. And because the linker is much simpler now, we can rewrite it in Go. The "gc" tool chain is based on the Plan 9 C compilers. The assemblers, C compilers, and linkers were lifted wholesale. The Go compilers are new C programs that fit into that tool chain. Wouldn't it be nice to have a Go compiler written in Go? Compiler overhaul: why C then? Today, Go does exist and is stable as of Go 1. These benefits not as relevant now. Compiler overhaul: why Go now? Translate the C compilers to Go. Write and use an automatic translator to do this. Start the process with Go 1.3 and continue in future releases. Develop and debug the translator. Translate the C to Go and delete the C code. Profile and optimize the compiler and split it into packages. Must have a way to build the compiler from scratch. Our plan is that the Go 1.3 compiler must compile using Go 1.2, and Go 1.4 must compile with Go 1.3, and so on. Write a shell script to do this automatically. Bootstrap once per machine. This scales poorly over time, so we might write a back end for the compiler that generates C code, and keep the C version of the compiler sources checked in. Write new compilers from scratch? The existing compilers are well-tested and handle many subtle cases well; would be foolish to throw away 10 man-years of effort. Translation is tedious and error-prone, mistakes are subtle and hard to find. Can continue to work on existing compilers while writing the translator. Translate just the back ends and connect to go/parser and go/types immediately? The existing APIs are very different; too much work to undertake at once. Discard the current compilers and use gccgo (or go/parser and go/types and LLVM)? The current compilers are a large part of our flexibility. Tying Go to large C/C++ projects like GCC or LLVM hurts that flexibility. As with previous releases, we'll see a long tail of small fixes and changes.